Last evening, the Manhattan Sephardic Congregation held a dinner for the Hilula of Rabbenu Hakham Ribbi Yoseph Chaim ‘a”h, also known as Ben Ish Chai (the title of his best known sefer). Who was the Ben Ish Chai? He was born in 1834 and was niftar in 1909. In 1859, at the age of 25 he became Chief Rabbi of Baghdad when succeeding his late father the Hakham Rav Elyahu. Rav Yoseph Chayim became one of the greatest of the modern-day Sephardic poskim. With his encyclopedic knowledge of all facets of Judaism (from the hidden and from the revealed), his approach was all encompassing; he considered the opinion of Ashkenazic scholars as well as Sephardic ones, and insisted that the opinions of “Acharonim” (Torah scholars from the 16th century onward) be considered along with the Talmud, of course, and the “Rishonim” (Torah scholars from North Africa, Egypt, Europe and Palestine between ca. 1000 C.E. and ca. 1500 C.E.) These included such great authorities as the Vilna Gaon, Rabbi Akiva Eiger and the “Chayei Adam,” and many others. On the 8th of Elul 5669, he went on a pilgrimage to he tomb of Yechezkel Hanavi. He became sick and on the 13th of Elul he passed away. The number present at his levaya was huge, and consisted of Jews and non-Jews alike who came to give honor to this great man. 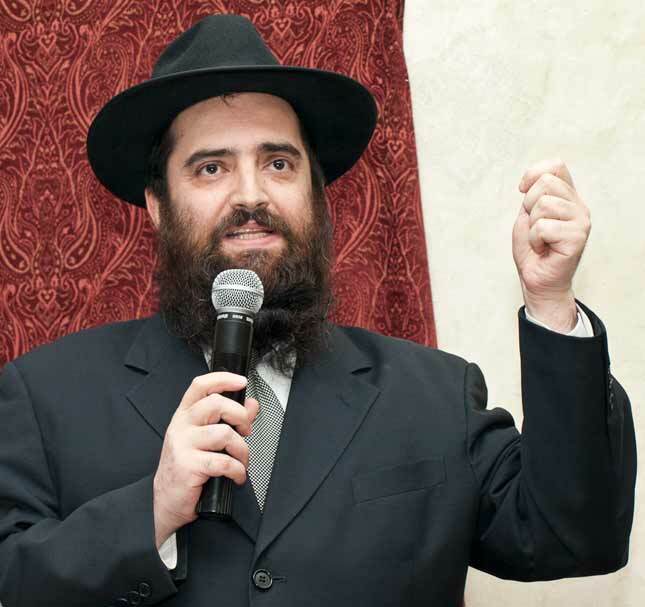 During a festive repast of authentic Iraqi dishes, Rabbi Raphael Benchimol (Rabbi of the Manhattan Sephardic Congregation), spoke and made a siyum Mishnayiot, culminating the study of the whole Seder Mo’ed. He ended with the last Mishnah in Chagigah, “Keitzad ma’avirin al taharat azarah? – How did they remove [the utensils] for the purpose of cleansing the Forecourt?” He explained it by bringing down some of the Ben Ish Chai‘s commentaries. The siyum was done during the year of passing of Rabbi Benchimol‘s father – Aharon ben Avraham, as well as in memory of the other sponsors’ parents: Eliyahu ben Reuven, Victor Gourji ben Lulu vChoua and David ben Avraham alehem hashalom. As part of his explanations on the Mishna, the Rabbi connected it with the theme and importance of the mitzvah of kibud av va’em – honoring one’s father and mother. Rabbi Matatia Chetrit spoke next about the lasting relevance of the Ben Ish Chai teachings, 103 years after his petirah. 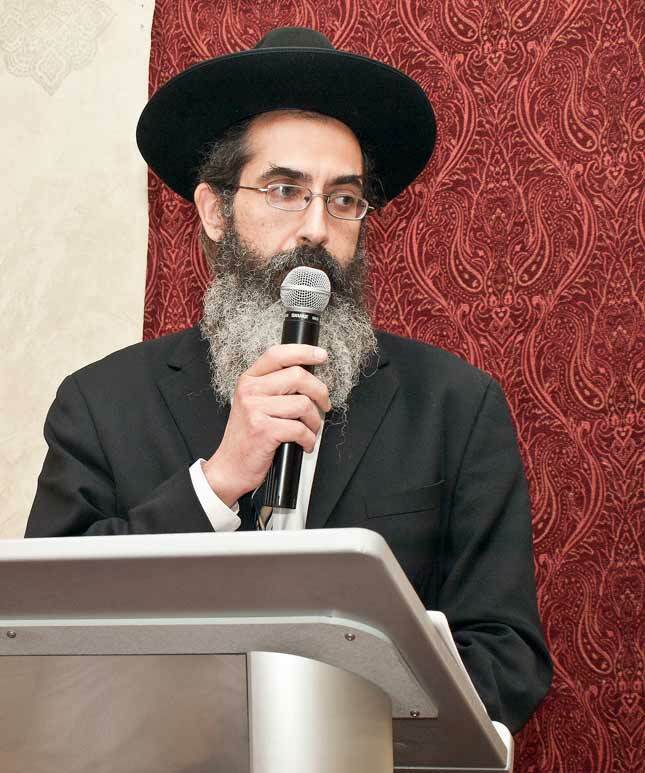 Rabbi Shalom Sibony, head of MSC‘s Kollel teaching staff, spoke next. There were almost a 100 people in attendance though the shot above gives only a partial view of the crowd. The food was prepared at Sidney and Tammy Cohen‘s 18 Restaurant. The sponsors of the Hilula were the Benchimol, Iny, Moche and Mukamal families. It was an inspiring, informative, delicious evening. What more can one ask? 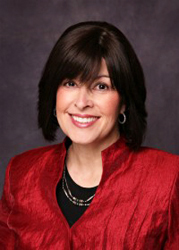 Our show, tomorrow evening – at 8:00pm (Eastern Time), on BlogTalkRadio.com/kosherscene will feature – as our guest – Judy Gruen (A Conversation with Judy Gruen). Who is she? Judy Gruen is an award-winning humor columnist, she’s published four books, and a self-described unrepentant chocoholic. Her laugh-out-loud funny essays as well as serious features appear regularly on Aish.com, as well as dozens of other media outlets, and her work has been anthologized in more than 10 books. Her new book, Till We Eat Again: A Second Helping, is a true chronicle of her efforts to lose a measly 15 pounds in time for a college reunion, and is getting rave reviews. Her humorous writings deal not only with the funny side of losing weight but she also dissects the subtle absurdities encountered in everyday life. You can read some of her columns at Judy Gruen’s OFF MY NOODLE, it will definitely prepare you for our conversation. Meanwhile, in case you missed it, why not tune in to last week’s show with cookbook iphone and ipod app author Gloria Kobrin? Gloria not only cooks, and cooks well, she is also very involved in many community activities. You will enjoy listening to our talk. Don’t forget to tune us in tomorrow evening, at 8:00 pm (Eastern Time) for A Conversation with Judy Gruen. We’ll be waiting for you! Reader Kochava Amar, from Tel Aviv, emailed us the following recipe and photo; it’s her family’s favorite salad, she writes. 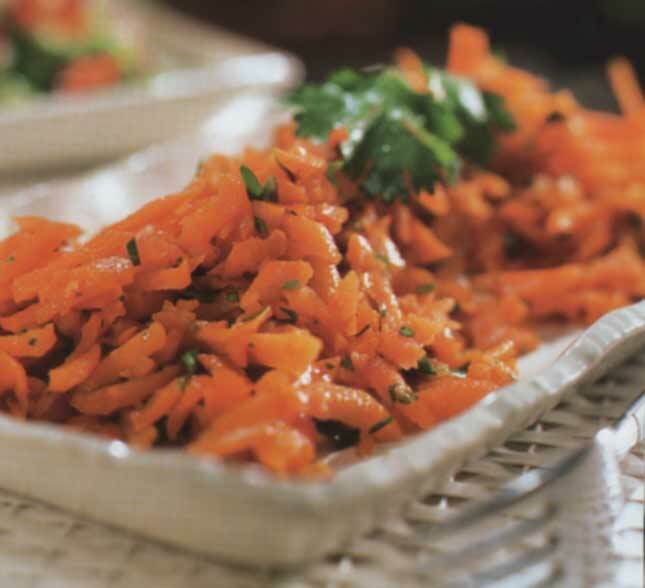 Using a hand grater or food processor (fitted with a grater blade), grate the carrots and turn into a large bowl. Heat 2 tablespoons of the oil in a small skillet over medium heat, add the garlic and fry for two minutes, or until the garlic starts to color. Add the salt, cumin, chilli flakes and sugar; stir to blend. Remove from heat and let it cool slightly. Stir in the remaining oil, chopped cilantro, orange juice, lemon juice, and ground cloves. Pour over the carrots and toss well. 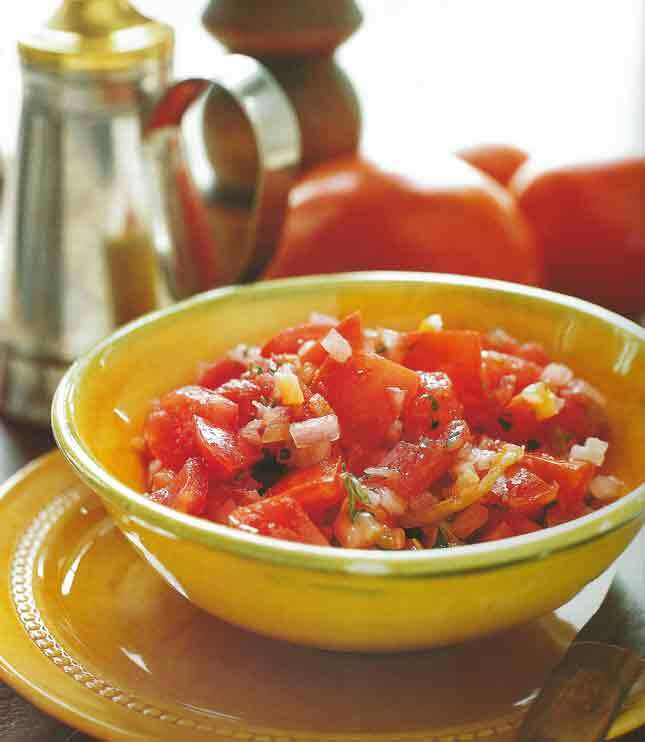 Cover and refrigerate for 4 hours or overnight, Spoon into a serving bowl and garnish with some cilantro leaves. For those who prefer it less spicy, you may skip the chilli flakes. Try it, your family will love it. This evening at 8:00pm (Eastern Time), The Kosher Scene Radio Show will host Gloria Kobrin. Who is Gloria? Gloria Kobrin, has been married for 40 years. As a mother of two, grandmother of two, she’s cooked her whole life for groups ranging from 4 to 100. She specializes in creating delicious gourmet food that is not only easy enough for the home cook to prepare but also happens to be Kosher. 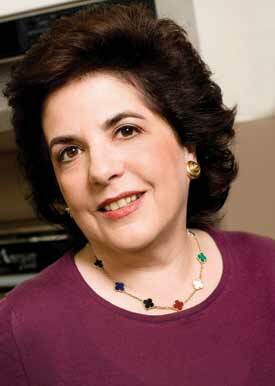 Mrs. Kobrin is the author of the Kosher Cookbook App for iPhone and iPod. Gloria shares her recipes and cooking tips on her Kosher Cookbook page on Twitter.com/Koshercookbook, on Facebook: http://www.facebook.com/KosherCookbookApp?ref=nf, and on her blog at: www.koshercookbook.blogspot.com. Soon after Gloria married she, and a friend, began the Kosher Gourmet weekly column in the Jewish Week. She also taught a Lunch and Learn series of cooking classes at Yeshiva University, while – at the same time – selling boutique baked goods from her home: fruit tarts, candied nuts, and specialty birthday cakes. Besides cooking, and baking, she’s been quite busy ghost writing poems and speeches for Bar Mitzvahs, weddings and miscellaneous celebrations. She has a certificate in translation (French to English) from NYU School of Continuing Education and is a trained mediator for community issues and has additional training in family and divorce mediation. We will be discussing not only her cooking and baking, but who she is as a person and as a proud Jew. 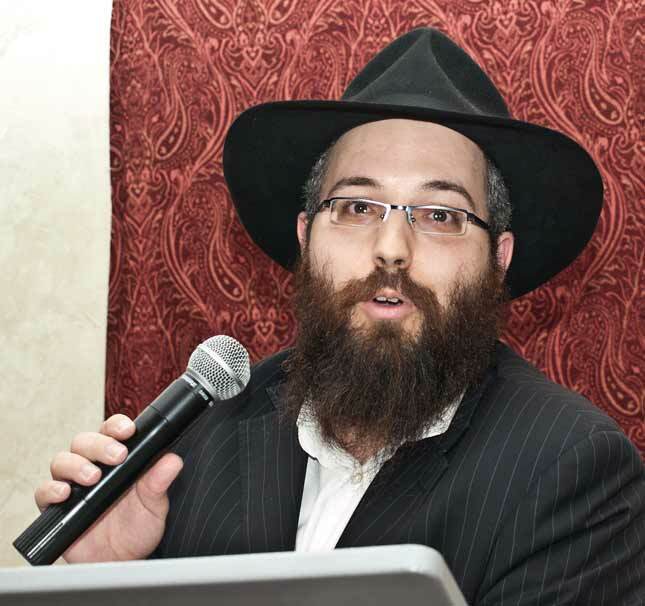 Meanwhile, in case you missed it please listen to our archived show with Menachem Lubinsky, the walking encyclopedia of kosher marketing and its history. Please tune us this evening on BlogTalkRadio.com/kosherscene, at 8:00pm (Eastern Time), The Kosher Scene Radio Show will host Gloria Kobrin. We’ll be wait’n for ya! If you can not get financier molds, you can make this recipe in mini muffin pans, lining them with paper baking cups before pouring the batter in the molds. The resulting financiers will be a bit larger, so you’ll have fewer, but they’ll taste just as good. Make the Batter: Sift together the confectioners’ sugar, finely ground blanched almonds, all-purpose flour,cocoa powder, and baking powder over a large bowl.Whisk in the egg whites, rum, and vanilla extract, until just combined. Whisk the honey into the margarine and whisk the mixture into the batter until everything is combined, and lump free. Cover the batter and refrigerate it overnight or up to 4 days. This allows the flour to relax. Bake the Financiers: Place a rack and preheat the oven to 375 F. Spray to 20 count financier molds with vegetable cooking spray. If using silicone molds, arrange them on a baking sheet. Sprinkler 8 to 10 mini chocolate chips in each cup. Spoon the batter into a pastry bag or resealable plastic bag, and cut a 1/4 inch opening in the tip or corner of the bag. 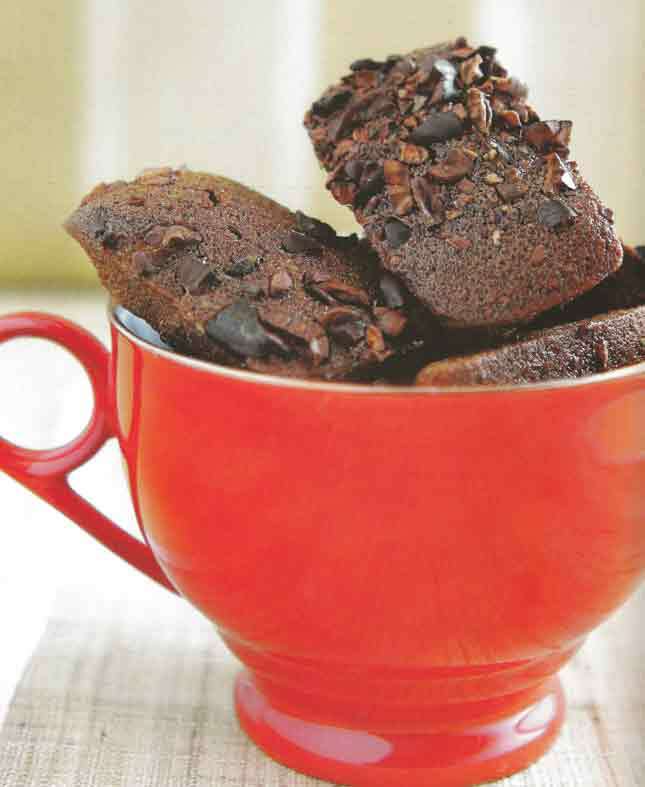 Pipe the batter almost to the top of each cup, and sprinkle cocoa nibs on the top. Bake 10 to 12 minutes, or until the financiers spring back when you lightly press on them and the sides slightly pull back from the edges of the molds. Remove the molds from the oven and leave them on the baking sheet. Let the financiers cool in the molds. They can be stored in an airtight container in a cool, dry environment for up to 2 days. Cut the lamb into thin slices. In a medium-sized bowl, combine the ingredients for the marinade. 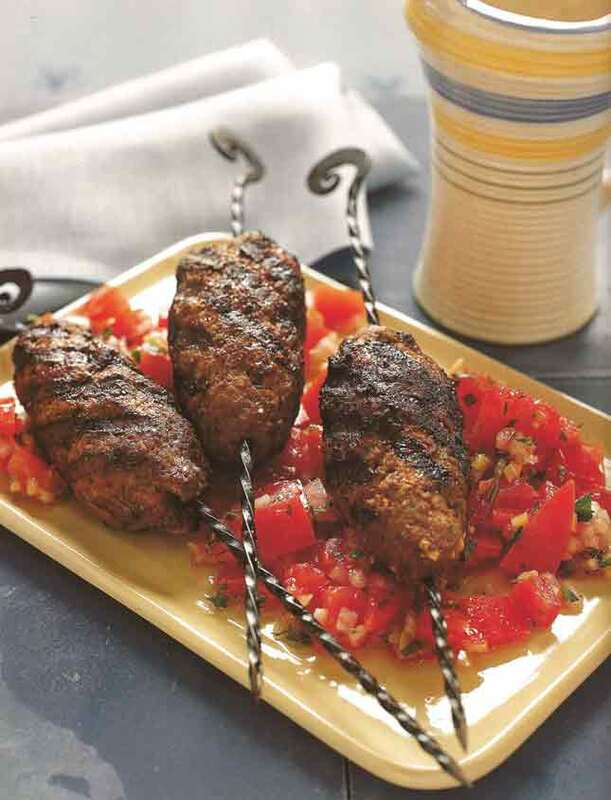 Add the lamb, mix well and marinade for 20 minutes at room temperature. Drain and discard the marinade. Heat a wok over high heat until it is very hot. Add the oil. when the oil becomes hot and starts tsmoking slighly add the the lamb and stir-fry for 2 minutes. Add the garlic, salt and pepper. Continue to stir-fry for another 3 minutes. Finally toss in the basil and coriander, and continue to stir-fry for 1 more minute or until the herbs have wilted. Turn onto a warm serving platter and serve at once. The garlic and basil, the two aromatic ingredients, make this an unusual but delicious dish. Melt the margarine in a large pan. Add the onion and garlic and cook over low heat, stirring occasionally for 5 minute, until softened. Add the ground beef, increase the heat to medium and cook, stirring frequently and breaking it up with a wooden spoon, for 8 to 10 minutes, until evenly browned. Add the tomatoes and bell peppers, reduce the heat and simmer, stirring occasionally for 15 minute, until the meat and vegetables are tender. 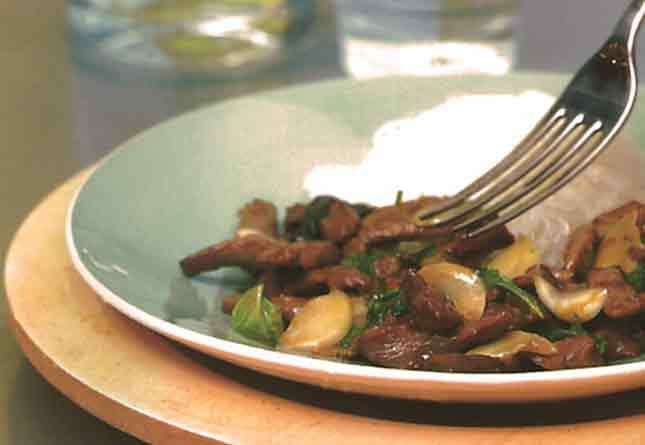 Stir in the Balsamic vinegar or the vegetarian Worcestershire sauce and parsley; season to taste with salt and pepper. Lightly beat the eggs in a bowl and season to taste with salt and peppe. 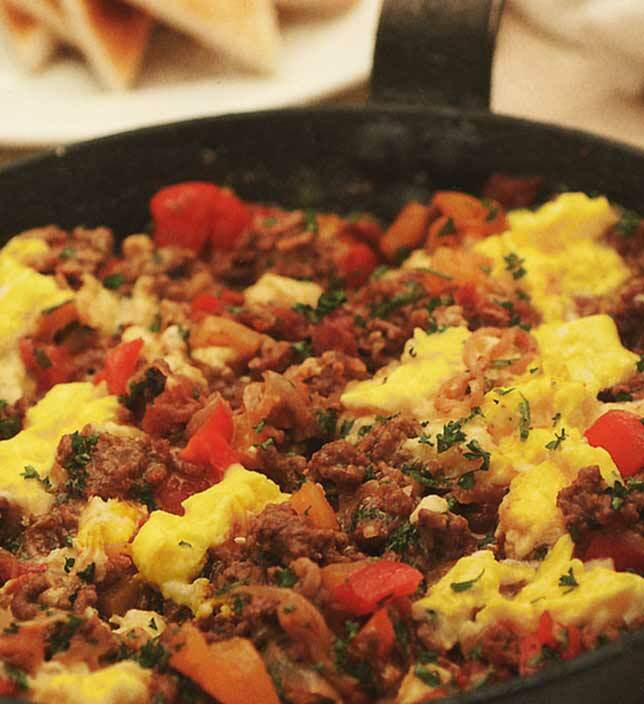 Add the eggs to the pan and coo, stirring for a few minutes until lightly scrambled. Garnish with parsley and serve with immediately with toast. Combine all ingredients in a blender. Pour into a saucepan and bring to a boil. Store in refrigerator. I made it earlier in the week and will make it again this coming Sunday, be’ezrat Hashem (it was that good). So… enjoy, gentle reader, enjoy! Put the peaches in an ovenproof dish; add the sugar, lemon juice, cornstarch , and almond extract, toss them all together. Bake the peaches in the oven for 20 minutes. 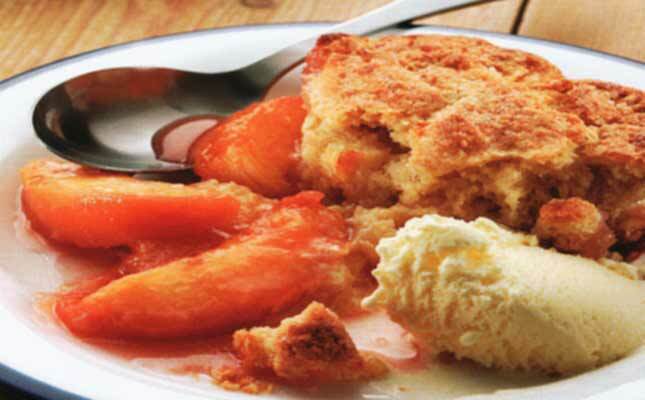 While the peaches are baking make the cobbler topping, sift the flour, all but 2 tablespoons of sugar, baking powder and salt into a bowl. Rub in the margarine with your fingers until the mixture resembles fine breadcrumbs. Combine the egg and tablespoons of almond milk in a pitcher and mix into the dry ingredients with a fork until a soft, sticky dough forms. If the dough seems dry, stir in the extra tablespoon of milk. Reduce the oven temperature to 400 F. remove peaches from oven and drop spoonfuls of the topping over the surface, without smoothing. Sprinkle with the remaining sugar, return to oven and bake for an additional 15 minutes, or until the topping is golden brown and firm – topping will spread as it cooks. Serve at room temperature with ice cream on the side. I often serve these potato wedges as a side dish for Shabbat evening and everyone loves them; in fact, they can’t get enough of them. They go great with beef or poultry, but I’ve been known to have them as a main dish sometimes during the week. Preheat oven to 450 F. Chop the garlic finely and put in a large bowl. Add the oil, parsley and rosemary. Cut the potatoes into 1 inch wide wedges. Add the potatoes to the bowl and sprinkle with salt. Toss to coat the potatoes with the oil mixture. 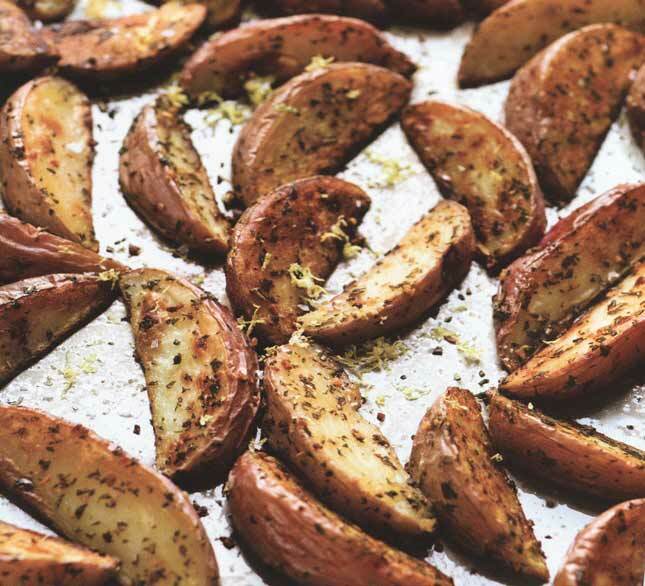 Spread the potatoes on a large baking sheet scraping the bowl of any extra oil and herbs. Arrange the potatoes with a flat side down. Roast until bottom is golden – about 25 minutes – turn with a metal spatula (some potatoes may stick, scrape them loose). Continue roasting until golden and crisp outside, but tender inside, about 15 minutes longer. Sprinkle with the lemon zest. Put the potatoes in a serving bowl, make sure to scrape up all the herbs and zest. Add several squeezes of the juice over the top. Toss gently to distribute and serve hot. You’ll like the aroma and you’ll love the taste!